District Technician Dale Goddard, right, presents the 2018 Outstanding Cooperator of the Year Award to Brian Everingham, left, who accepted the award on behalf of his mother, Jeanine Everingham of St. Paris. Jeanine Everingham of St. Paris was named Outstanding Cooperator of the Year at the Nov. 8 annual meeting of the Champaign Soil and Water Conservation District. Her son, Brian Everingham, accepted the award on behalf of his mother. 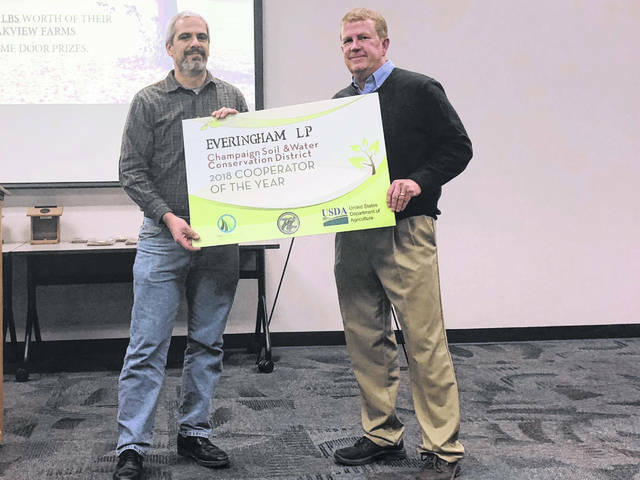 The award is presented each year to a landowner or farmer whose efforts as a good steward of the county’s natural resources are recognized by the conservation district’s board of supervisors and staff. The Urbana FFA judging teams were presented plaques for winning the Urban and Rural land judging contests. Incumbent Justin Dagger and new candidate Todd Dallas, both of Urbana, were elected to three-year terms as district supervisors. The SWCD expressed appreciation to Heather Toops of Cable and Mia Grimes of Christiansburg for running as candidates for the positions. The SWCD also expressed appreciation to retiring Supervisor Rick Jordan for his service. The SWCD’s next annual meeting will celebrate the agency’s 75th anniversary.